Yesterday, the 16th of November, the III Impact Innovation Talks was held and was organized by Telefónica Open Future together with PWN Madrid. 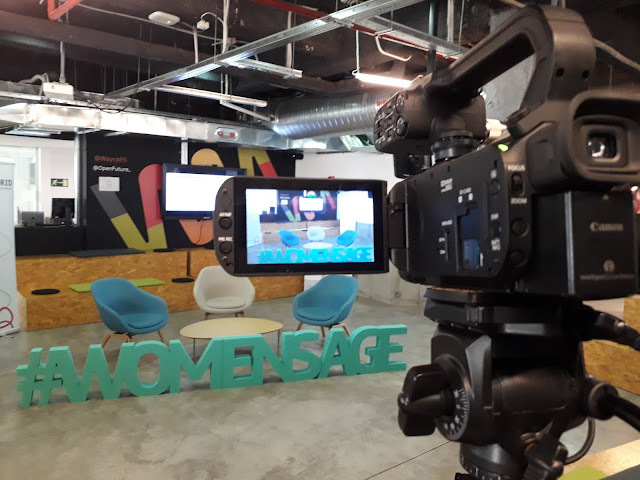 This third edition of a talk series with the slogan #WomansAge aims to reflect on the situation of female entrepreneurs. This time the event covered 3 themes and their challenges, achievements and opportunities. Pedro A. de Alarcón was one of the speakers in the event, as the head of Big Data for Social Good at LUCA Data-Driven Decisions, and he wanted to empashize the benefits that the value of Big Data can provide when improving society. Figure 1 : The Wayra auditorium on Gran Vía ready for the III Innovation Talks to start. 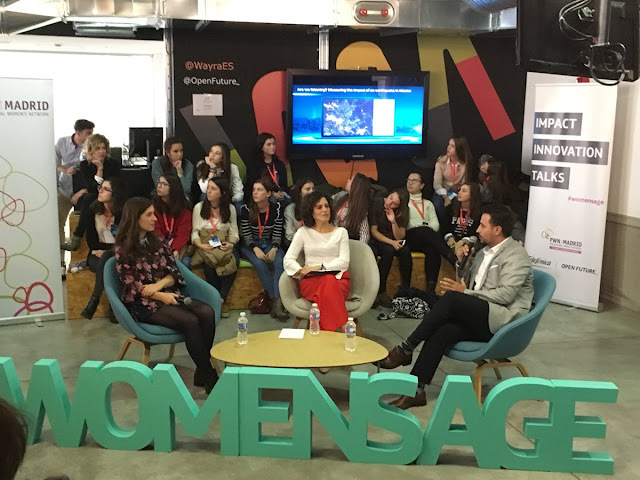 Due to the Women's Entrepreneurship Day on November 19th, Telefónica Open Future_ held the III Impact Innovation Talks with the main goal of reflecting on the situation of entrepreneurial women on society. The event was organized under the #WomensAge initiative in collaboration with PWN Madrid and involved the participation of many experts in big data, machine learning, cybersecurity and artificial intelligence's related fields. Helena Díez-Fuentes opened the event by welcoming all the attendees and the presentations began with Ángela Shen-Hsieh, head of predictive behaviour at Telefónica and Ramón López de Mantaras, director of the Instituto de inteligencia artificial del CSIC. They spoke about AI and the opportunity of predicting human behavior. According to Ángela Shen-Hsieh "there are many challenges for IA, and one of the keys is that it needs data to work better, to know more about us, so IA can also work better for us". Along the same lines, Ramón López de Mantaras also agreed that “the challenge now is to provide a better overall experience for us, as a consumer, as a customer... but to do it in a way that we have some protection and we can protect our privacy. The challenge is to make this data work for us, providing machines with common sense”. Also, they both said the main problem is that data can be biased and there is a big need to not to let that happen. Figure 2: Rebeca Marciel and Pedro A. de Alarcón during their talk at the III Innovation Talks. Rebeca Marciel, head of Gartner Consulting, alongside Pedro Antonio de Alarcón, head of Big Data for Social Good at LUCA, presented the concept of BD4SG, by making it clear that "the potential for good thanks to the value of data is now a reality". Pedro A. de Alarcón played a demo aimed at demonstrating how big data can contribute in helping underdevolped countries in the case of a natural disaster or pandemic threats. One must always work together with other data sources to make this data helpful. They also addressed data privacy, emphasazing the importance of an ethical use of data and the need to develop Corporative Social Responsability to make sure we can use data's power for good. And last but not least, Yaiza Rubio, Intelligence analyst at ElevenPaths, and David Barroso, founder of Countercraft, discussed the challenges of cybersecurity and data. According to both experts, the most important thing is being ready to predict what will come next. Thus, "the main challenge is to provide a easy structure in which everyone can get the information they need from the internet, but having the tools to analyze the security they have". They both agreed with that technology reflected the society and that there are two main points: the feelings of anonymity and invulnerability we can have when browsing in the web. This makes it easier for people to commit crimes and that is why we all need to make sure we can have an easy but secure digital experience. The main goal of Intelligence Analysts such as Yaiza Rubio is to find the way of having both national security and privacy needs fulfilled by improving the knowledge about the related challenges, achievements and opportunities of this field. Figure 3: A view of the Wayra auditorium Wayra during Yaiza Rubio's talk at the III Innovation Talks. During the closing event, Raquel Cabezudo, chairwoman at PWN Madrid, thanked all the speakers and attendees for coming to the III Innovation Talks and asked people to keep improving the ideas they have, as innovation and entrepreneurship will be the best engine to make the world a better place in the future.